Stephen Fortner’s full review can be found at the Acoustic & Digital Piano Buyer site. To check out the entire Spring 2017 issue and learn more about Acoustic & Digital Piano Buyer, visit their homepage. The award-winning FP-90 offers premium piano performance, great looks, and easy portability in one instrument. Roland’s SuperNATURAL® Piano Modeling tech recreates the entire sound process of an acoustic piano, providing rich, full tone with authentic touch response. Complementing this sound engine is the PHA-50 hammer-action keyboard, which combines wood and molded materials for traditional feel and lasting durability. The FP-90’s advanced sound system delivers enough volume and punch for performing situations. With its newly developed onboard audio system, the FP-90 provides big, vibrant sound for playing at home or performing in intimate venues. And with built-in Bluetooth® capability, you can easily work with a mobile device and use apps like Piano Partner 2 and Piano Designer, play along with songs through the speakers, and much more. Gigging players will appreciate the instrument’s easy mobility, while home-based users can pair the piano with the matching KSC-90 stand and KPD-90 pedal for an attractive integrated look. The FP-90’s unique blend of high performance, portability, and style is a great fit for any type of piano application. It excels for both home and stage use, and is also ideal schools, private lesson studios, and music production setups. Learn more about the FP-90 Digital Piano at RolandUS.com. 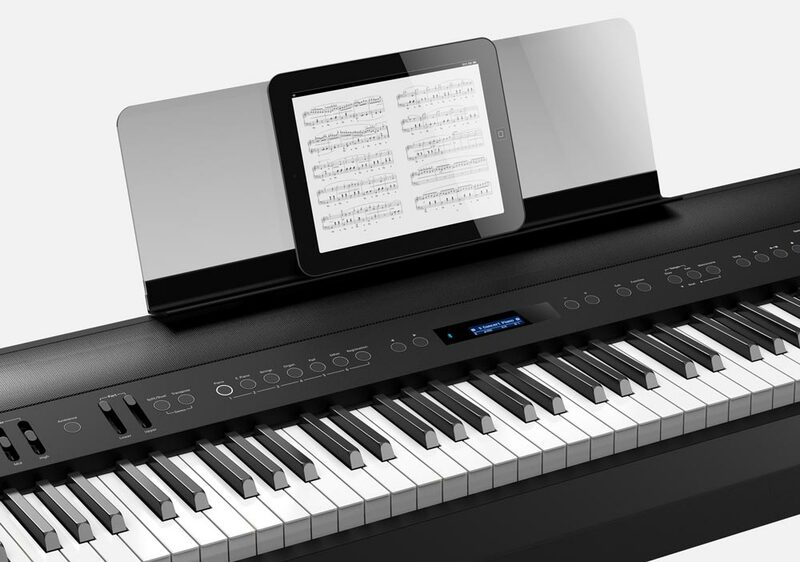 With built-in Bluetooth connectivity, FP-90 users can enhance their piano experience with an iOS or Android mobile device.